Sweetspot Intelligence is the Information Delivery platform for Enterprises looking to ease integration burdens while making effective data-based decisions. Enjoy all the benefits of full digital and offline data integration, combined with Digital Insight Management™ functionalities for unparalleled data-backed collaboration and Storytelling. Sweetspot Intelligence provides everything you would expect from an enterprise information delivery platform, including limitless possibilities with ETL and ad hoc modeling, combined with full storage and batch uploads at the back-end. Let us do the work! We’ll build a custom data model that speaks the language of your organization by transforming your multi-source data sets into cohesive information. View key segments or apply custom timeframes to personalize your dashboard and discover the answers to your most important business questions. 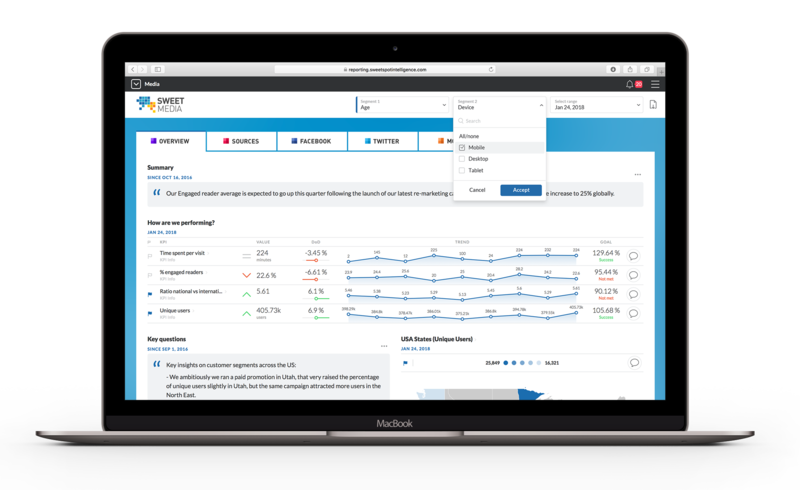 Supplement team expertise with automated insights to optimize marketing performance. Limitless reporting possibilities are only a click away.